DISCOUNT DEALS: new 7-day special offers from Sevenoaks Sound & Vision | What Hi-Fi? Fancy a 25 per cent discount on Monitor Audio's Silver RS range of speakers and subwoofers? Then check out the latest 7-day special offers from Sevenoaks Sound & Vision. The discounts are available from today until Saturday, December 5th in Sevenoaks stores, but not online or by mail order. 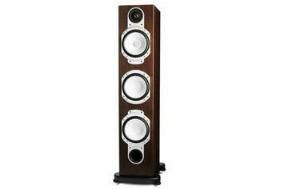 Sevenoaks has Monitor Audio RS5, RS8 and RSW12 models in stock in a variety of finishes – all are new and boxed. Multichannel receiver deals include the Sony STR-DA2400ES for £389, Yamaha RX-V565 for £329 and the Onkyo TX-SR607 for £349. You can also pick up the Award-winning Panasonic SC-BT200 Blu-ray in a box system for £439 (normal price £499) or a Yamaha YSP-40D soundbar for £799 (normal price £1000). TV deals include a free Blu-ray player with the Philips 42PFL9664 and 47PFL9664 TVs, and £150 cashback on the Samsung UE40B7020 (£1149) and UE46B7020 (£1449). Panasonic's TX-L32V10B (£779) and TX-L37V10B (£959) TVs both come with a free five-year warranty, and you can add a Panasonic DMP-BD60 Blu-ray player to either set for just £50 extra. The larger Panasonic TX-P42G10 is available for £829. Other discounts available include the Award-winning Marantz CD6003, PM6003 and Wharfedale Diamond 10.1 hi-fi system for £595 (previously discounted to £599), Panasonic's DMP-BD60 Blu-ray player for £155 (was £159) and Sony's STR-DH800 AV receiver for £275 (was £279). Quote "7-day web special" when you go to a Sevenoaks store to override normal pricing.